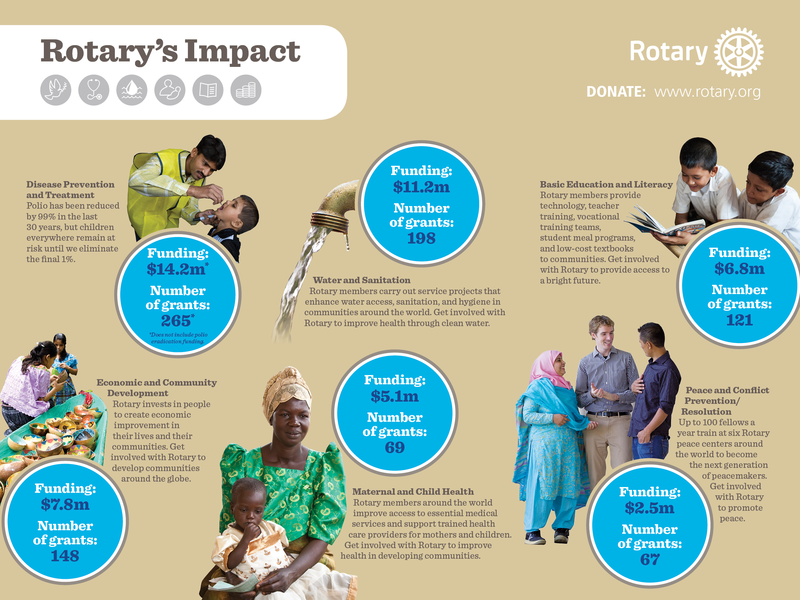 Rotary’s impact on the world since our founding 110 years ago Click to enlarge. Happy birthday to us! On February 23, we celebrate the 110th anniversary of Rotary International and we have a lot to show for it. On this day in 1905, Rotary founder Paul Harris formed one of the world’s first service organizations, the Rotary Club of Chicago, as a place where professionals with diverse backgrounds could exchange ideas and form meaningful, lifelong friendships. Since then, Rotary has continued its commitment to service by providing clean water, improving maternal health, awarding scholarships, fighting diseases, and improving lives around the world. This year, also marks the 30th anniversary of the PolioPlus program. Since the fight to end polio began, 2 billion children have been immunized, 10 million children have been saved from lifelong paralysis and 125 countries have been declared polio-free. During the week of February 17 – 23, share with others how we are “this close” to ending polio and highlight Rotary’s 110 years of service. Want to be a part of something amazing? Check us out by coming to one of our meetings. We meet every other Monday at 6:30 PM at Bru’s Room, Hillsboro & 441. See our schedule for exact dates. Guests are always welcome!